My family visits the Dominican Republic every year to give out school supplies to my dad's hometown. This summer, I was able to join them. This is part 1 of a 3 part blog to share our trip. How: My dad works all year round to fill and ship tanks full of school supplies and clothing to be able to give back to his hometown. Some supplies are donated from friends and family but most supplies are purchased out of his own pockets. He also pays to ship each of the containers before he arrives. This is my dad. He is the oldest of 16 children. He tells the story about how him and his siblings shared school supplies and how not all of them could go to school at the same time. He himself was only able to complete up to the second grade. Each year he fills and sends tanks full of supplies to be able to give children from his community what he never had. We emptied out each of the tanks and laid out all of the supplies in front of my dad's childhood home. Everyone pitched in to help! Each bag was filled with a notebook, pencils, pens, a ruler, a small toy and where we could, crayons, calculators, a ruler and glue. 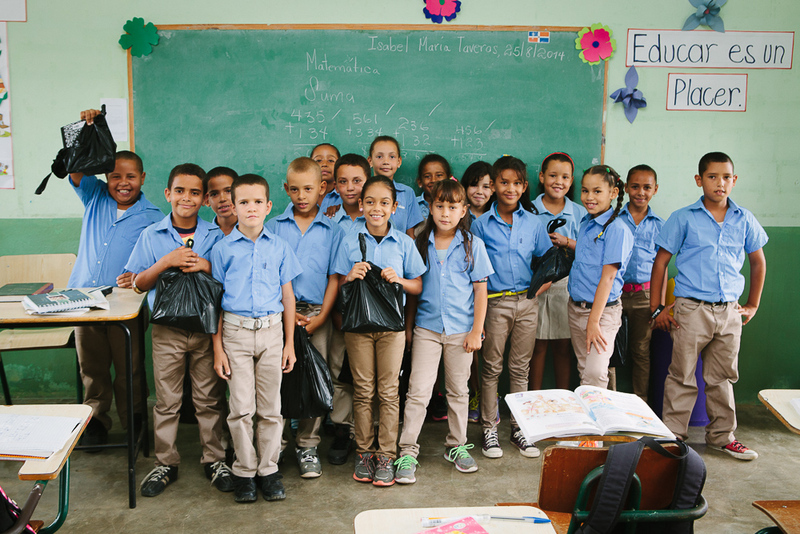 We were able to make over 200 bags of school supplies and we were able to visit 7 local schools and 1 church. My nephews ages 10, 6 and 3 helped to give out supplies in each of the classrooms. This was a night when we visited the local church and gave out bags filled with school supplies to each of the children. We were also able to give out Spanish and French Bibles, a few toys and clothing. We are still in need of finding Creole Bibles for the Hatian members for next year! Happy students, grateful to have received new supplies for the new school year. Thank you to everyone that helped us with donations and well wishes. It was such a wonderful experience! We have already started to collect school supplies for next year. If you'd like to donate for next year, please contact me!